What's a farm without a great tractor? 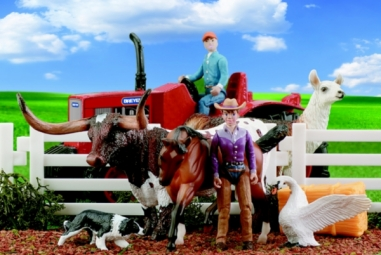 That's why Breyer created this delightful tractor play set which includes a farmer, cowgirl and a bevy of farm animal friends - a Stablemates dun Quarter Horse, Border Collie, swan, llama and a longhorn steer - for hours of imaginative play for girls and boys. It contains all the fun of a real farm in one box! Perfect for Stablemates fans! Set includes: Farmer, cowgirl, Quarter Horse, steer, llama, swan, Border Collie, hay bale and tractor.